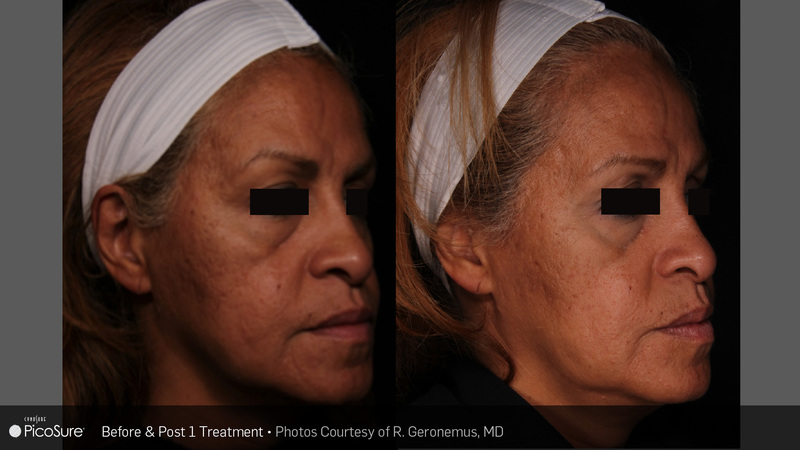 Achieving a more youthful appearance without the typical discomfort and downtime is now possible with PicoSure®. 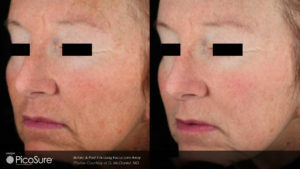 Santa Fe Vein & Med Spa now provides this breakthrough technology to remove unwanted pigment, as well as treatment for wrinkles and acne scars. PicoSure gently delivers short bursts of energy to target problem areas. 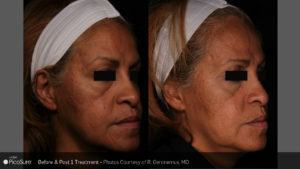 This innovative technology can help you achieve a more youthful appearance. PicoSure® is the world’s first and only picosecond aesthetic laser platform for multiple aesthetic applications including tattoo removal, acne scar treatment, removal of pigmented lesions and wrinkle treatment. 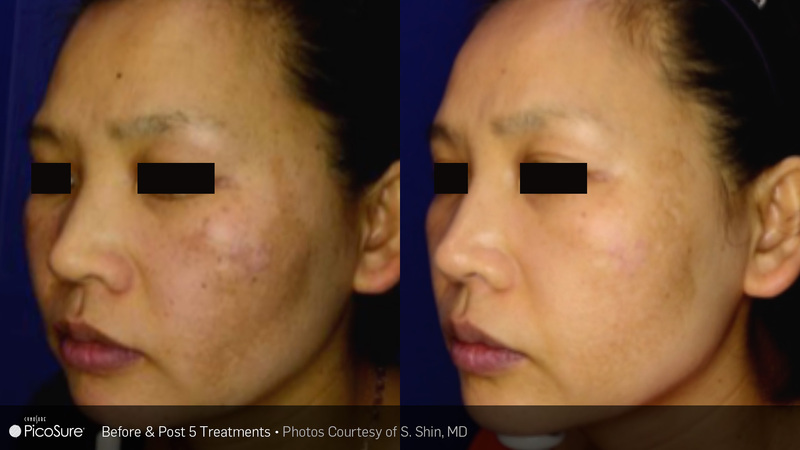 This unparalleled breakthrough in laser technology delivers ultra-short pulse bursts of energy to the skin in trillionths of a second to gently target and eliminate pigment without harming the surrounding skin. Improve the look of your skin and achieve a more youthful appearance by removing pigment or treating wrinkles and acne scars faster than ever before with PicoSure. It’s important to consider your options. Face-lifts, fillers, and toxins are associated with significant downtime, risks, and side-effects. 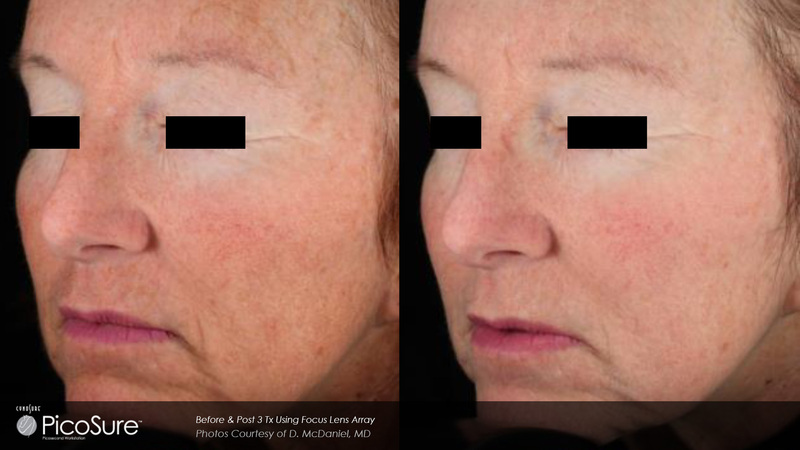 Patients often consider these treatments a “last resort.” The first step to achieving a more youthful appearance or just tweaking some trouble-spots may be a PicoSure laser treatment. Speak with our office today to see if this treatment is right for you! 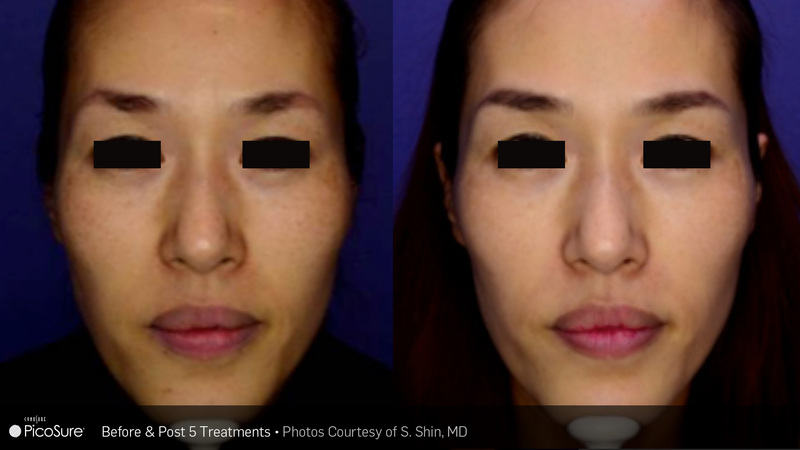 Lasers remove a variety of unwanted pigment. 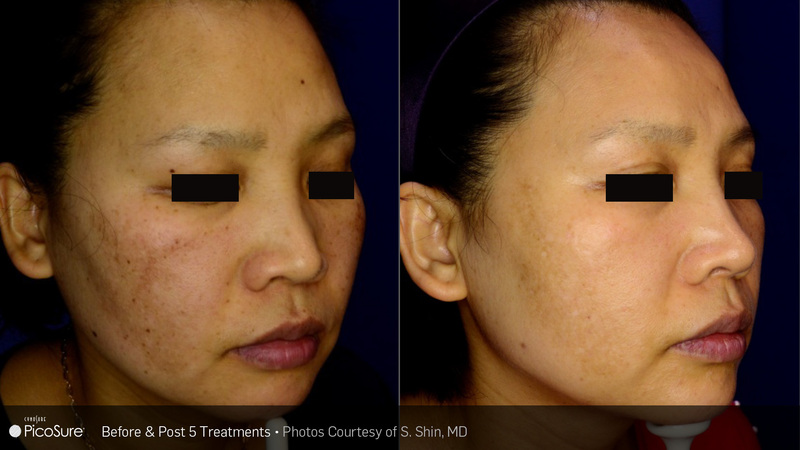 Age spots, freckles, and brown patches can all be removed with PicoSure. 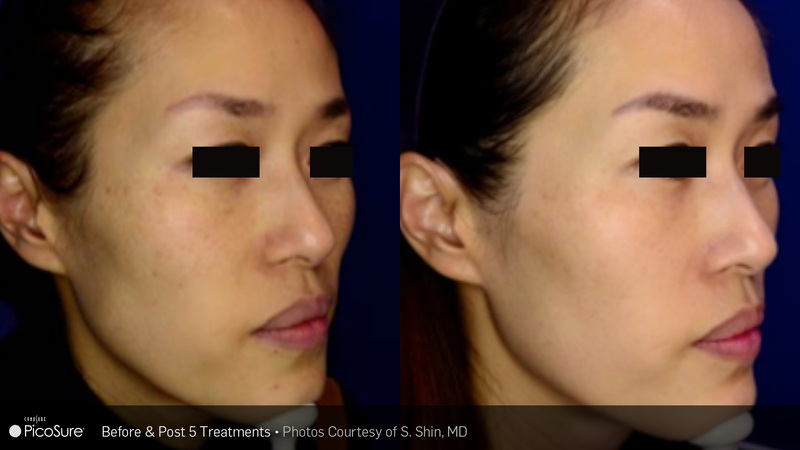 During a free consultation, your practitioner will put together a treatment regime to help you achieve pigment-free skin fast. 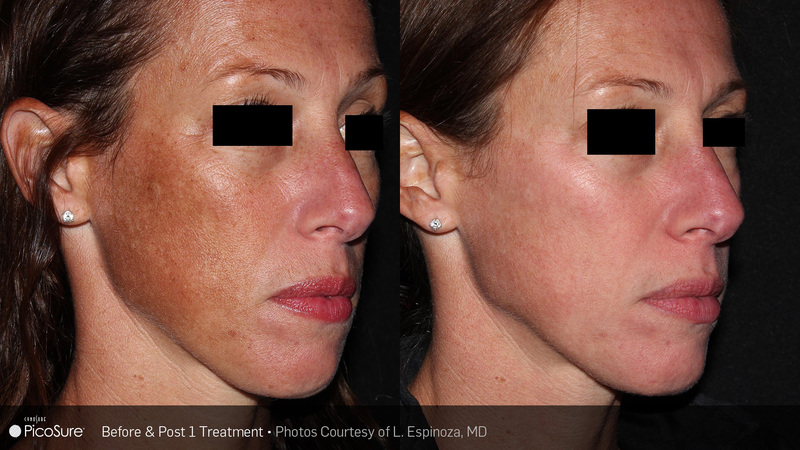 To improve the look of your skin and achieve a more youthful appearance by removing pigmented lesions will require only a few treatments. 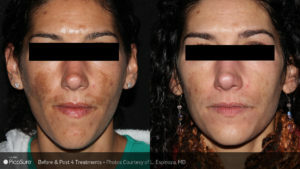 Darker, deeper and larger pigmented lesions may require additional treatments; however during the consultation, your practitioner will discuss treatment expectations with you. After the procedure, the treatment area may be tender. It is important to keep the area clean and to avoid any irritation. Your practitioner will provided additional after care instructions as needed to ensure a quick recovery.